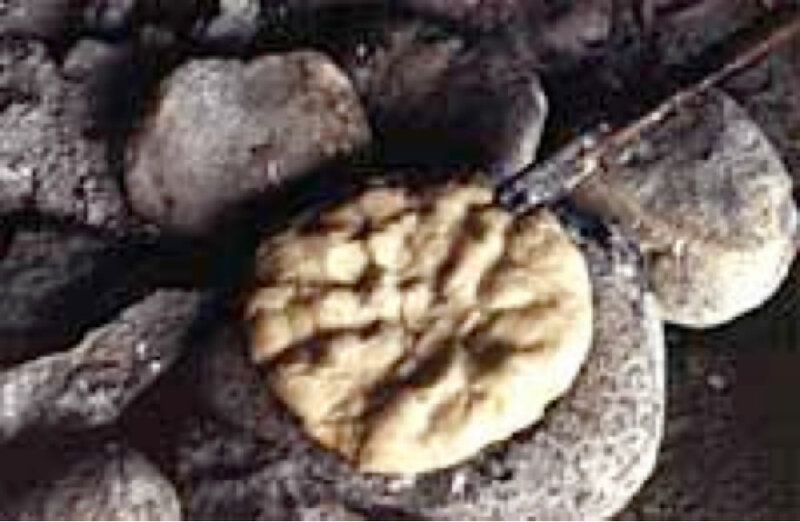 Bread has been baked from wild-gathered grains since before the last Ice Age. Israeli archeologists found settlements of people who lived 23,000 years ago, known as the Nabateans. Their diet consisted of diverse wild grains, animals from gazelle to rabbit, fish and wild-gathered greens, nuts and berries. Abundant charred seeds at their sites suggest that grains comprised about 50 percents of their diet. (1) To learn more watch 'Stories of the Stone Age'. Parching: Soak the hulls-on einkorn grains in water for a few minutes, then parch (singe) the seedheads over an open flame using a sieve or hot rock. The grains were parched on the sheaf in ancient days to loosen the hulls. 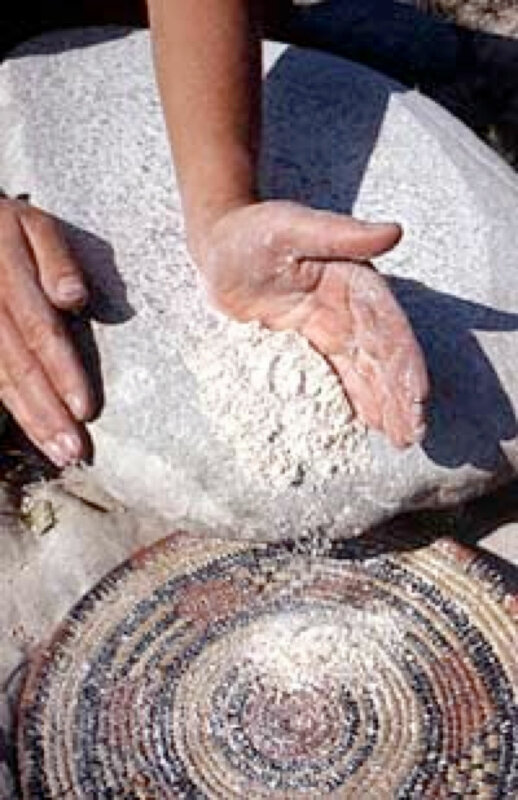 Milling: Grind the grains using a rock on a grinding stone. Winnow the crushed grains to separate the flour from the chaff. Mixing: Mix the flour, a pinch of salt and dash of oil or animal fat with water and last week's dough until the dough is thoroughly mixed and springy to the touch. Baking: Separate the dough into fist-sized balls and let rise for a few hours in warm weather or over night in cooler weather. Pre-heat the baking stones in the fire. Place the dough-balls on the hot stones. 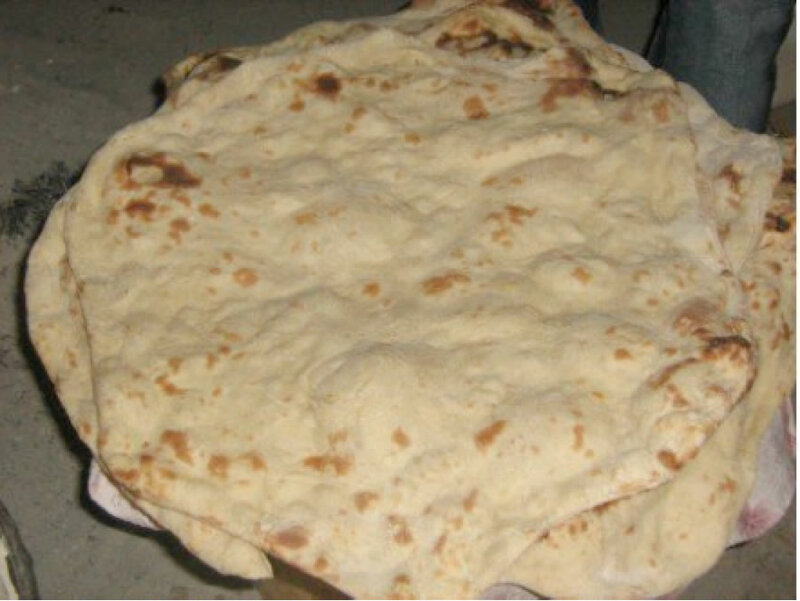 The low gluten of einkorn will fall into a puffy flatbread shape in the heat. Bake them on each side until golden brown. 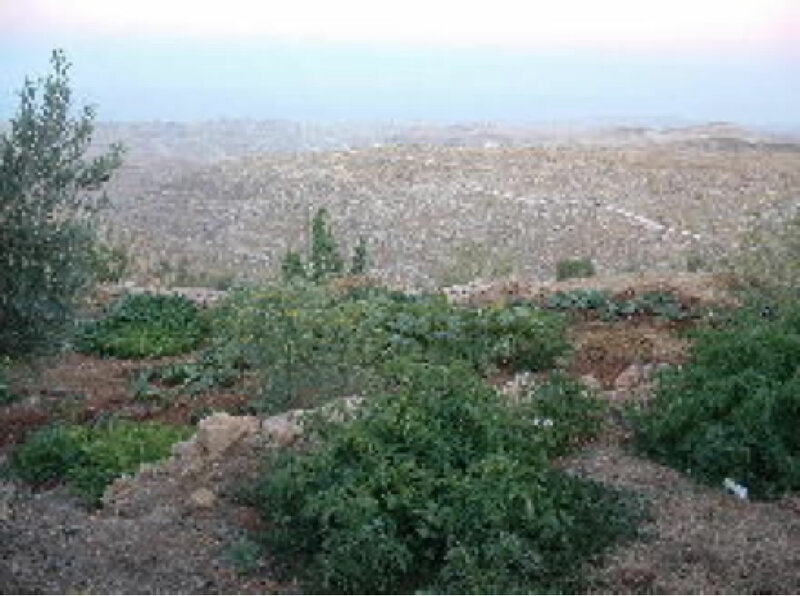 Garden of wild edible lettuce, arugula, chickpeas and emmer growing today near Nabatean site. I collected the wild seeds during a hike and replanted them in an ancient terrace 100 feet from an 11,000 year old Nabatean site in Israel.